If you fancy a new kitchen to brighten up your home, there are ten thousand reasons to ‘like’ a new competition that costs nothing to enter. 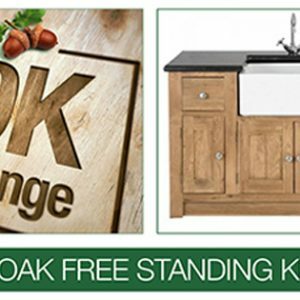 Oak Free Standing Kitchens, which trades from Leeming Bar, near Northallerton, North Yorkshire, is running a social media competition to give away an Oak Freestanding Kitchen. The competition launches on July 1st and will be held on the company’s Facebook page. Once the magic figure of ten thousand likes has been reached, managers will select one of the people who clicked ‘like’ to win the prize. And it’s a prize worth winning because Oak Free Standing Kitchens produce bespoke kitchens which are in demand all across the UK and, more recently, with customers living in France. The business, which was formed eleven years ago, employs a team of skilled craftsmen using traditional methods to produce high-quality and unique kitchens using the very best oak and granite. Managing Director Jason Hadlow said: “The competition is an excellent way to thank the people who have supported us down the years. We are very proud of the kitchens we produce. In an age of mass-produced furniture, they are unique and much in demand. “We have always shown great respect for traditional ways of working when it comes to making kitchens but we are also a very forward-looking company so using social media to run our competition is exciting.